My name is Alex Borton and I've been with Laughing Buck Farm for about a year now. 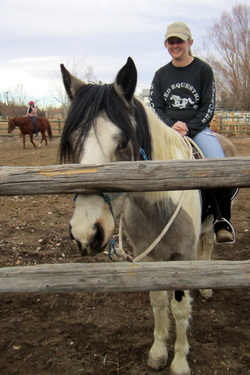 I'm a double major Equine Science and Psychology student at CSU. I grew up riding horses in Michigan where I spent 12 years in a local 4H program where I competed in everything from jumping to barrel racing. Which would probably have to be my two favorite events to ride in. In addition to 4H I was also an active member of my high schools equestrian team and an assistant coach for the middle school team. I spent the past two summers in Buena Vista giving guided horse back tours through the mountains which was an amazing experience and gave me the opportunity to teach all kinds of riders and ages. And also gave me the opportunity to ride all different kinds of horses from Welsh ponies to Percherons. My own horse right now is a five year old Mustang named Chance whom, in my opinion, is the smartest and sweetest horse in the world. 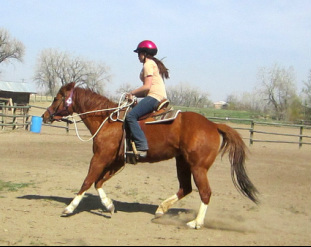 I've taught him almost every thing he knows using all natural horsemanship methods, which has built the amazing relationship we have today. In addition to him I also have one incredibly obese deaf cat named Toby who gets brave from time to time and likes to explore the small patch of farm surrounding my apartment. The small amount of time I'm not spending with my animals I love reading and exploring all of the amazing trails and hiking opportunities Colorado has to offer.